Last Thursday, Loyola University Chicago students held a demonstration in solidarity with the protesters at the University of Missouri. The resignation of the former president of the University of Missouri, Tim Wolfe, and Chancellor R. Bowen Loftin, elicited a renewed national fervor for eliminating systems of intolerance from university administration. Loyola’s own protest mirrored similar demonstrations by sympathetic student bodies across the country and aimed to address problems with diversity prevalent on our campus. Protests that occurred at other institutions also voiced their discontent with less than desirable responses to racial insensitivities by university administrators. Recent protests at the University of Missouri and Loyola University Chicago, as well as the larger national Black Lives Matter movement and Concerned Student 1950, led me to think about the similarities between the demands of the student body now, and those of black Mundelein College students in the years following the assassination of Dr. Martin Luther King Jr. in 1968. Mundelein College, an all-women’s catholic liberal arts college founded by the Sisters of Charity of the Blessed Virgin Mary (BVMs) in 1929, proved a progressive stage for the discussion of race and diversity on college campuses in its time. 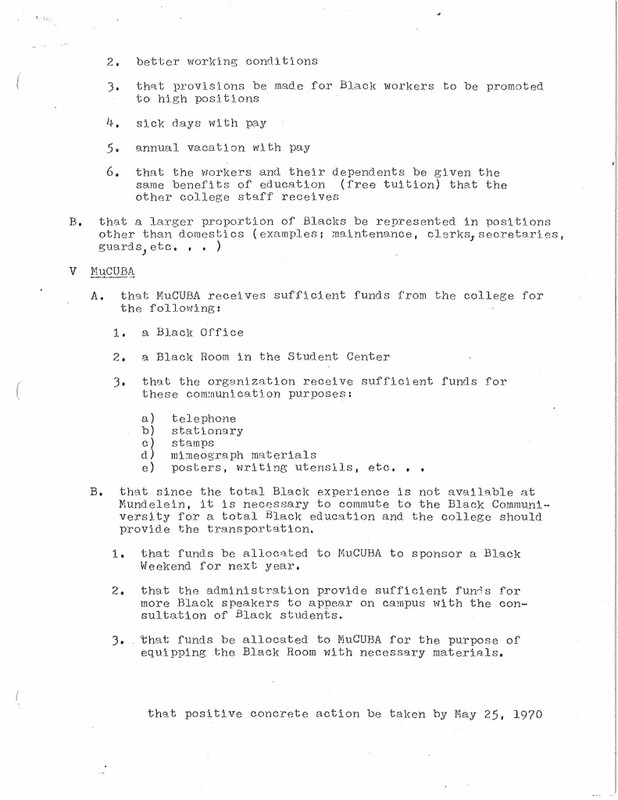 Black Mundelein students effectively mobilized to promote administrative and academic diversity for the black community at the college, resulting in the creation of university programming, committees, and departments that addressed the concerns of black Mundelein students. Mundelein College affiliated with Loyola University Chicago in 1991. 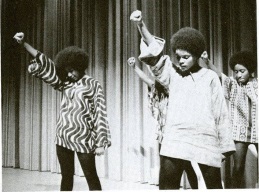 The Mundelein College United Black Association, shortened to “MuCuba,” was a student organization founded by black Mundelein students that emerged in the later 1960’s, but gained significant visibility in the early 1970s. MuCuba strove to create a unified black presence on Mundelein’s campus and worked in many forms to achieve this goal. Throughout its history, MuCuba hosted panels, fashion shows, and an annual celebration of Martin Luther King, Jr. that attracted numerous attendees within the Mundelein community as well as interested Chicagoans. MuCuba students advocated for safe spaces to voice their ideas and hold forums for productive discussions of race and diversity on Mundelein College’s campus. Significantly, the association also fought for the inclusion of a Black Studies program into Mundelein’s curriculum to address historically oppressive practices and policies toward black Americans in the United States. Picture Source: MuCuba Members. 1970 Yearbook, page 18. Mundelein College Collection. 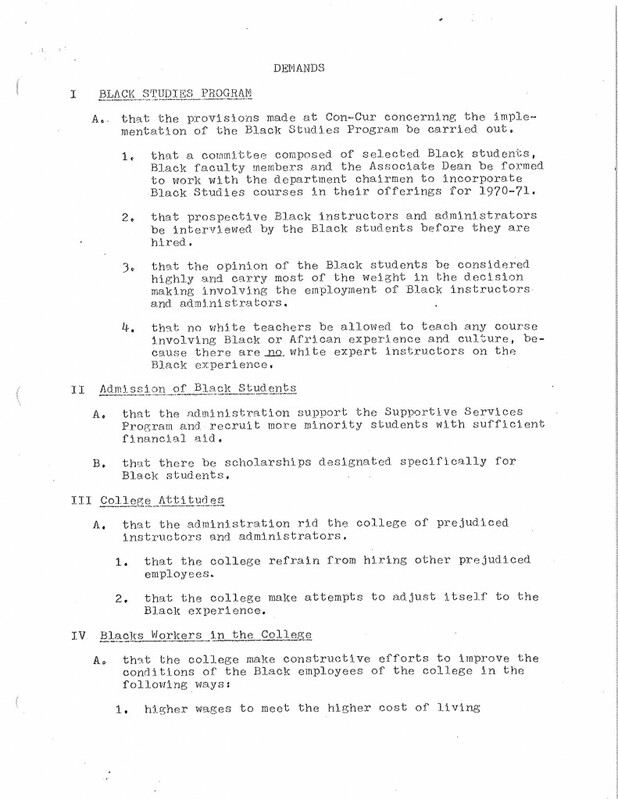 In a forum held on May 15, 1970, MuCuba students presented the Mundelein community and administration a list of demands that addressed the institutionalized racism they saw and experienced as women of color on a largely white campus. MuCuba students gave the president of Mundelein, Sr. Ann Ida Gannon, BVM, and university administrators a ten day deadline to respond. The urgency exhibited by these students exemplified their belief that the administration must hold themselves both personally and professionally accountable for the livelihood of its black student body. Gannon acted swiftly in response to the demands. 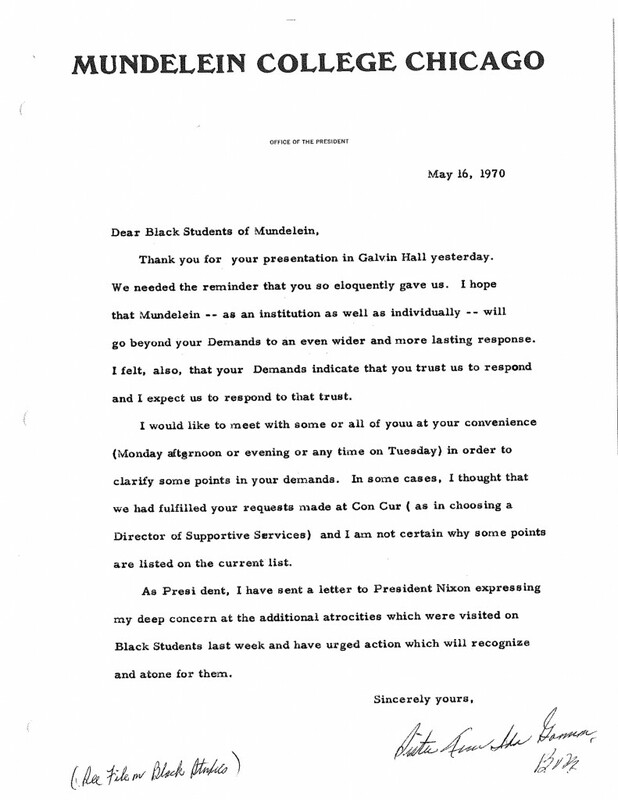 According to a letter Gannon wrote a day after the presentation of the demands, the president expressed a hope that Mundelein would fulfill the demands in a manner that could satisfy the protesters and institute a response that had lasting influence for years to come. She wrote, “Your demands indicate that you trust us to respond and I expect us to respond to that trust.” On May 19th, Gannon scheduled a day long assembly of an ad hoc committee to discuss the demands of the black students. Within the deadline, Gannon presented a lengthy response to the demands and recommendations for their effective implementation on Mundelein’s campus. Many of those recommendations became official programs and departments implemented the next semester. The demands and subsequent compromises resulted in the creation and eventual implementation of Mundelein College’s Black Studies program with a faculty interviewed and evaluated by black students. Beginning the fall semester of 1970, the new program aligned with MuCuba’s efforts to create a unified black on-campus culture. Creation of the Black Studies department at Mundelein also displayed an acknowledgement by the faculty that greater attention to problems of diversity on Mundelein’s campus was needed in order to eradicate racism and promote better understanding of the problems of black students on campus. A Human Relations Committee composed of faculty, administration, college staff, and students also emerged as a result of the ad hoc committee assembly held on May 19th. The Committee developed programming to aid the Mundelein community in recognizing personal prejudice and to help students, faculty, and administration better understand the experiences of black students. Furthermore, the demands resulted in a Black Scholarship Fund and a Black Scholarship Fund Committee that raised and dispensed funds for black students that wished to attend Mundelein. Document Source: “Demands” Folder F.8.13.a. Mundelein College Collection. Women and Leadership Archives. Both of the student bodies, Loyola University Chicago’s now and Mundelein’s in the 1970s, articulated similar goals and used comparable strategies to affect change on their campuses. Like MuCuba, Loyola University Chicago student protesters presented the interim president John P. Pelissero with a list of “concerns” as they relate to the experience of students of color on-campus. Although the list does not appear to be publicly available, a statement by President Pelissero stated that “the Office of Student Development, the Office of the Provost, and Human Resources will collaborate to advance this campus conversation.” Further, he remarked that University leaders will discuss the concerns and continue the dialogue in the coming weeks so that the “momentum” from last week’s demonstration is not lost. Similarities between Loyola’s current atmosphere of racial protest and the actions of past Mundelein students are unmistakable. Both groups of students, past and present, expressed frustration and unhappiness with the culture of racial intolerance they saw enacted at their institutions. Each set of protesters presented demands to university administration with the expectation of campus leadership listening to their concerns and responding with appropriate action. 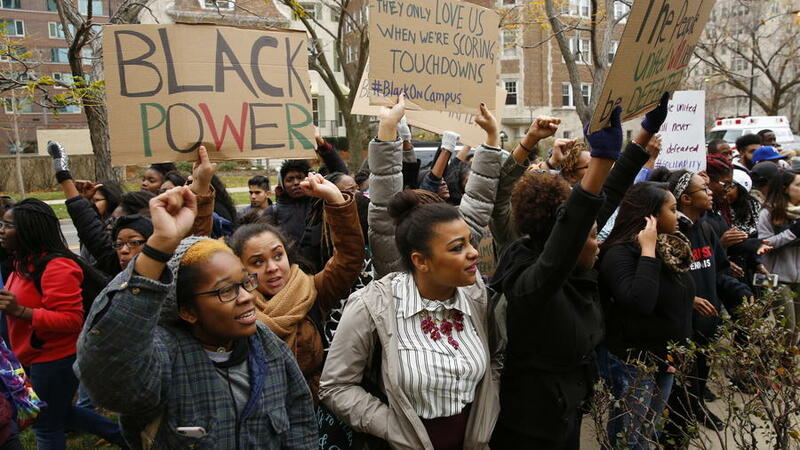 Mundelein’s successful protests resulted in the creation of programs that endeavored to ease racial tensions and promote thoughtful dialogue about issues of diversity on their campus. Loyola’s present outlook is more uncertain, but I am optimistic the result will be the same. It is important to place conversations such as these in a historical context. It is also undeniably important to advocate for students to be able to exercise their right for self-expression, especially as it relates to problems of diversity and race on our campus. Knowing that MuCuba successfully advocated for greater attention to their plight on Mundelein’s campus should provide student protesters in the present proper inspiration to continue their fight against racial injustice. Success stories like MuCuba’s will hopefully encourage the Loyola University Chicago protesters to continue to hold the administration accountable for their on-campus experience, and push further for substantive change so that demonstrations will not be so necessary in the future. This entry was posted in Collections Highlights, Events, Mundelein College by Women and Leadership Archives. Bookmark the permalink. An outstanding, thoughtful, and insightful blog post. Great work Ellen!